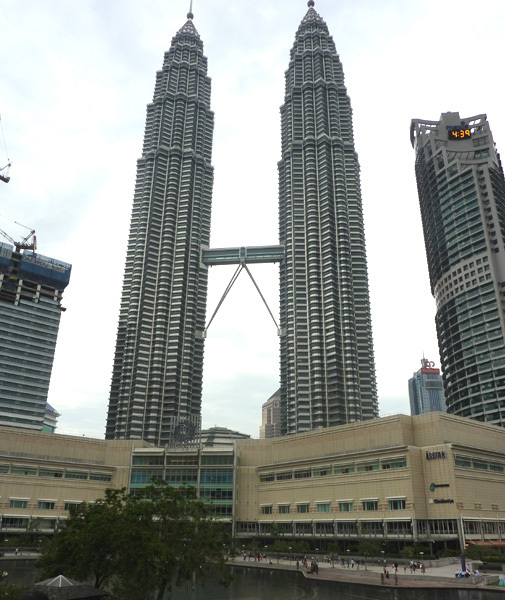 If you are thinking of making the trip to Malaysia next year, for the 41st IVU World Vegfest, October 3-9, 2013, you might be interested in some views of Kuala Lumpur from my visit a couple of years ago. On Monday October 25, 2010 – I was up early to take the eight-and-a-half hours Air Asia flight from Gold Coast, Australia, to Kuala Lumpur, Malaysia, where I was staying with the veg writer Mohana Gill and her family. The flight time made me realise just how far away Australia is from anywhere else. 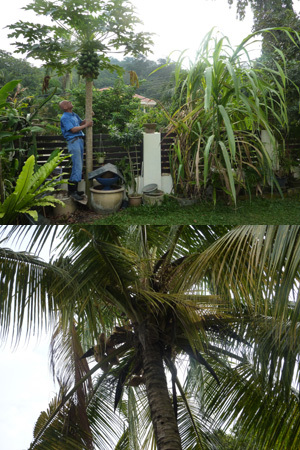 Below: the eminent Dr. Satwan Gill getting down to some gardening, and one of his palm trees. This was just on the edge of the city, but for me it sums up how I generally think of a country like Malaysia. I met up with some more friends from the Malaysian Vegetarian Society, and had a brief visit to the famous Twin Towers (many people will remember Sean Connery dangling from the bridge between them...). For some years this was the tallest building in the world, now overtaken by Shanghai and Dubai. Note the size of the people at the bottom of the photo. 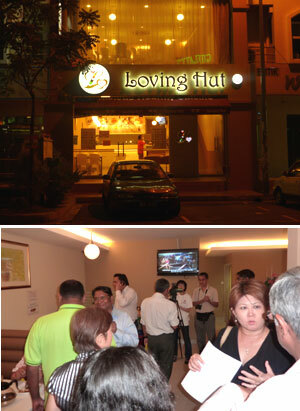 The MVS had arranged for me to give a talk in the room upstairs at the local Loving Hut restaurant, all videoed by SMTV. We got a good audience who responded well. Right: the Loving Hut run by Tracy Wong, the lead organiser for the combined 41st IVU World Vegfest and 6th Asian Veg Congress next year. - and the SMTV crew busy with more interviews after my talk. Those who were at the 40th Vegfest in San Francisco or Los Angeles, California, 2012, or the 5th Asian Congress in Hangzhou, China, 2011, will have met Tracy - she will be putting all that experience to good use back in Malaysia. 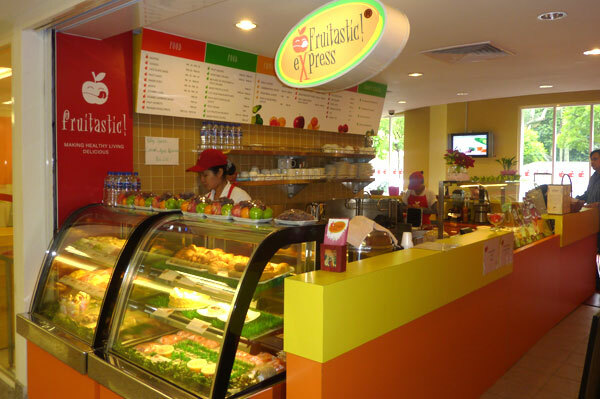 Mohana Gill is the author of 'Fruitastic' and 'Vegemania' cookbooks, and has now added two books for children on a similar theme - and a 'Fruitastic Express' (below), a shop/cafe/juice bar inside a local hospital and used mainly by patients, visitors and staff. Most things in the shop and the small cafe at the far end, are based on fresh fruit and vegetables, with the emphasis on health and nutrition. What a contrast to hospitals in west, sponsored by McDonalds, KFC and the like, where patients are likely to come out more ill than they went in after eating all that junk food. Mohana has set a great example that should be followed by hospitals everywhere. I was invited to extend my trip by visiting Penang, in the north of Malaysia, but with only three days available, before I left for India with Mohana and Dr. Satwan, it would have been too much to fit in. However - the IVU World Vegfest will be going there - and it really is worth the trip. Apart from being a beautiful part of the country, very popular with tourists, it also had a very active veg scene. A major part of the Malaysian Vegetarian Society is based there, led by Pishu Murli Hassaram, who also promotes the International Meatless Day, every November 25th.